charge mobile without charger | World's Most Amazing Videos, Pictures, Facts. 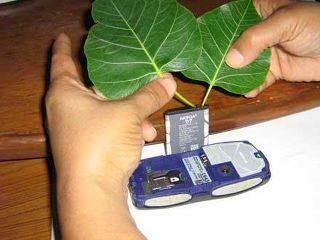 Now charge your mobile with people leaves. No need of sockets and chargers. Phone battery flat? Yell at it! Gadget uses your voice to charge mobile! Mobiles will be charged while you talk through it!! Most Amazing Facts - Charge mobile with your voice! It could go down as one of the most irritating inventions in history. Scientists have devised a gadget that will allow mobile phones to be recharged simply by talking into them. The technology turns sound into electricity, allowing a mobile to be powered up while a conversation is in progress – and the greater the volume the greater the charge. The invention is billed as a godsend for those who regularly suffer the frustration of flat batteries. But there are fears it will simply be an excuse for inconsiderate phone-users to make even more annoyingly noisy calls in public places. The technology could also be used to power up personal music players, raising the possibility of charging an iPod by singing along to your favourite songs. Dr Sang-Woo Kim, of Sungkyunkwan University in Seoul, South Korea, said that just as speakers transform electric signals into sound, the opposite process of turning sound into a source of electrical power is possible. Dr Kim’s device uses tiny strands of zinc oxide – the main ingredient of calamine lotion – sandwiched between two electrodes.